How many times have you watched or read the news, saw some story about an earthquake, hurricane, typhoon, or some other disaster and think “that will never happen here”? Stop kidding yourself; disasters can happen almost everywhere. I’ve always considered Ireland to be relatively safe. We don’t have (anything you’d notice) earthquakes, typhoons, or tornadoes; our cattle and sheep don’t need flying licenses. Our weather is dominated by the gulf stream, keep Ireland temperate. It doesn’t get hot here (we are quite northerly) and our winters consist of cloud, rain, and normally about half a day of snow. We get the tail end of some of those hurricanes that hit the east coast US, but there’s not much left by the time they reach us – some trees get knocked over, some tiles knocked on our roofs, but it’s not too bad. Even when we look at our neighbours in England, we see how their more extreme climate causes them disasters that we don’t get. Natural disasters just don’t happen here. Or do they? The last month or so has revealed that to be a lie. 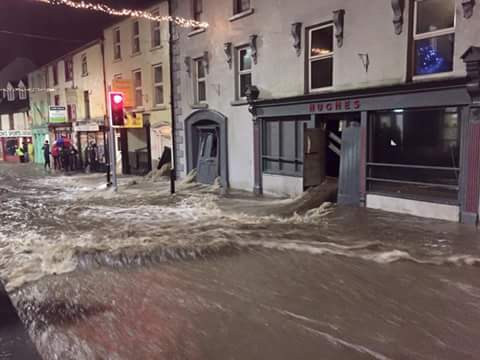 Ireland has been battered by 6 storms in the past month. The latest, Storm Frank, was preceded with warnings that the country was saturated. That means that the ground has absorbed all of the water that it can; any further rainfall will not be absorbed, and it will pool, flow, and flood. Frank isn’t finished. It’s still blowing outside my office and more rain is sure to fall. There are stories of communities being evacuated to hotels, and the above photos are just the easy ones for the media to access. This isn’t just a case of cows trapped in fields, stick a sandbag on it and you’re sorted, or somewhere far away. This is local. And Ireland is a relatively safe place – we’re not Oklahoma, a place that some deity has decided should be subject to cat 5 tornadoes every time you’re not looking. Dorothy, the point is, that disasters happen everywhere, including in the EU where we think it safe. Let’s bring this back to business. Businesses have been put out of action by these floods. Odds are any computers or servers were either on the ground floor or in the basement. Those machines are dead. That means those businesses are dead. They might be lucky enough to have tapes (let’s leave that for another time) stored offsite but how reliable are they and will bare-metal restore work, or will it take forever? How much money will those businesses lose, or more critically, will those businesses survive loss of customers? The need is there, as we can clearly see above. And thanks to Microsoft Azure, DR has never been so affordable. FYI, it comes in at a price that is a small fraction of the cost of solutions from the likes of Irish companies such as KeepITSafe – I’ve done the competitive pricing – and it opens that customer up to more technical opportunities with hybrid cloud solutions. Microsoft Azure Site Recovery Services (ASR) is a disaster recovery-as-a-service (DRaaS) or cloud DR site offering from Microsoft. The beauty of it is that it’s there for everyone from the small business to the large enterprise. It works with Hyper-V, vSphere or physical machines, and it works with Windows or Linux as long as the OS is supported by Azure (W2008 R2 or later on the Windows side). Note: There is a cost overhead for vSphere or physical machines to allow for on-premises conversion and forward and in-cloud management and storage, so you need a certain scale to absorb that cost. This is why I describe ASR as being perfect for SMEs with Hyper-V and mid-large companies with Hyper-V, vSphere or physical machines. If I had ASR in place, and I has a business on the quayside in Cork, near the Slaney in Enniscorthy, or anywhere else where the rivers were close to bursting the banks then I would perform a planned failover, requiring about 2 minutes of my time to started a pre-engineered and tested one-click failover. My machines would shut down in the desired order, flush the last bit of replication to Azure, and start up the VMs in the desired order in Azure, and my machines and data would be safe. I can failback to new equipment or stay in Azure if the disaster wipes out my servers. And if that disaster doesn’t happen, I can easily failback to new equipment, or choose to stay in Azure and not worry about local floods again. Aidan, how do you then access the servers from Azure? For example a file server that your users access via mapped drives? Or an application server? Easiest way: RDS/RemoteMap. You extend your AD into VMs in Azure so you preserve all your GPOs and the user experience. This is the design I use in PoCs and it works well. Not familiar with RemoteMap… you don’t mean remoteapp by any chance? What’s the experience like using RDS and Skype? Any tips on enabling Skype in that Azure based DR environment?